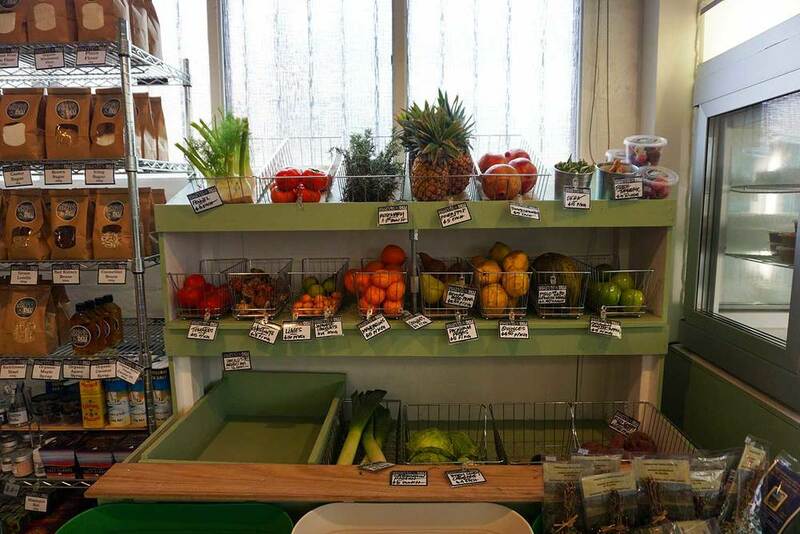 The Spring Street Grocer is an organic grocery store, come takeaway lunch spot, come gelateria. The vegan options for lunch are quite good, as are the bountiful vegan sorbet and gelato options. For lunch, you can't go past the 'Tofu and corn fritter w/ curried cashews, cucumber & coriander' ($9.50) complete with a side of salted potato chips. 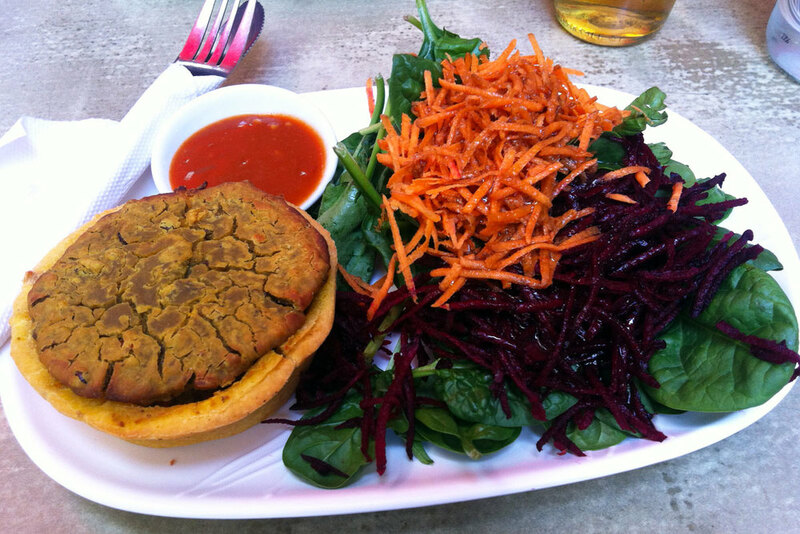 An 'Open vegan salad sandwich' ($8.50) is also available. There is also a 'Tempeh Burger', which disappointingly contains fish sauce. If a burger doesn't take your fancy, you could try one of the daily 'organic, non dairy, wholefood salads' ($8 small, $12 large) or a takeaway vegan soup. 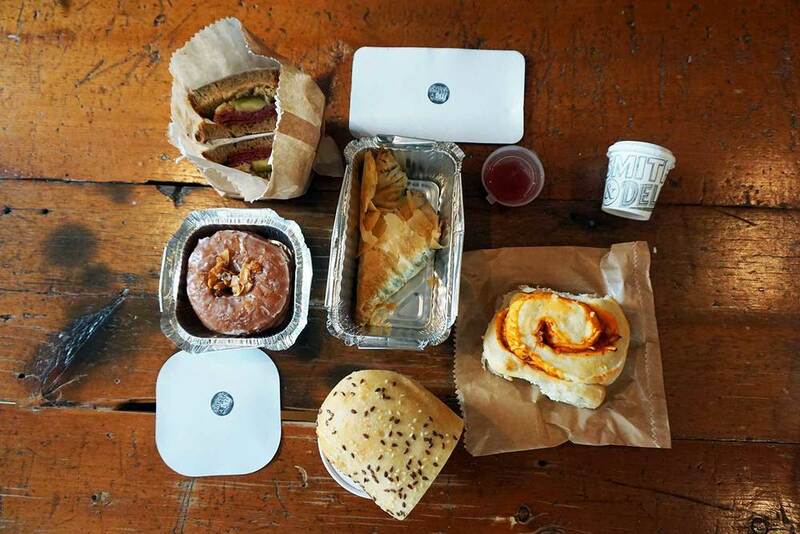 The catch with these delicious lunches is that they are available only on weekdays (11am-3pm) so will be of benefit mainly to those lucky office workers nearby. There is very limited seating inside, so takeaway is a good option. The grocery store is jam-packed with an assortment of organic goodies, many of which are vegan. The cold pressed juices (made on site) are highly recommended and you can also stock up on vegan yoghurts (coyo and babushka), as well as many vegan chocolate varieties. The gelato/sorbet bar has 8-9 vegan flavours that change daily. 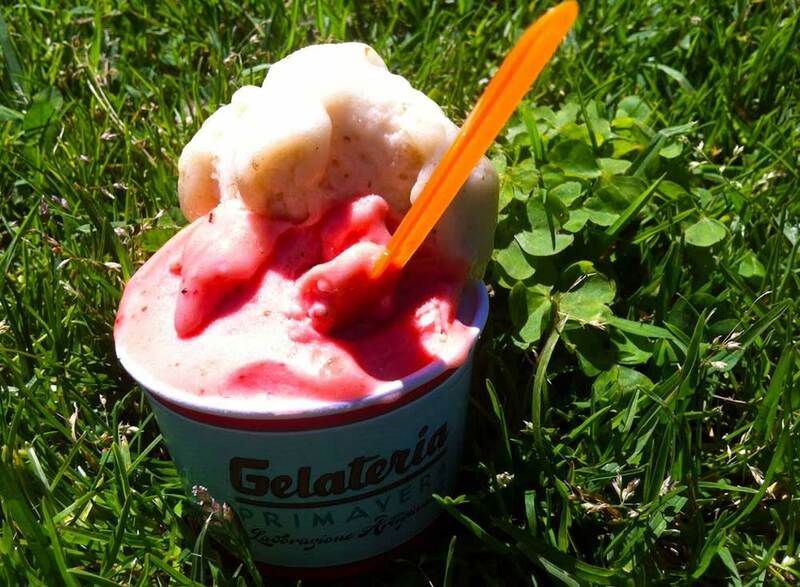 All of the sorbets are vegan, and the vegan gelati varieties have a base of almond, oat, rice or coconut milk in lieu of dairy. The sorbet flavours are quite exotic and include 'pear & cinnamon', strawberry & mint' and 'white nectarine & basil' - they are divine. Vegan gelato flavours include 'chocolate & orange' and 'zesty coconut'. McGain's Nursery, Cafe and Food Store is a green and welcoming oasis hidden in the industrial centre of coastal Anglesea. 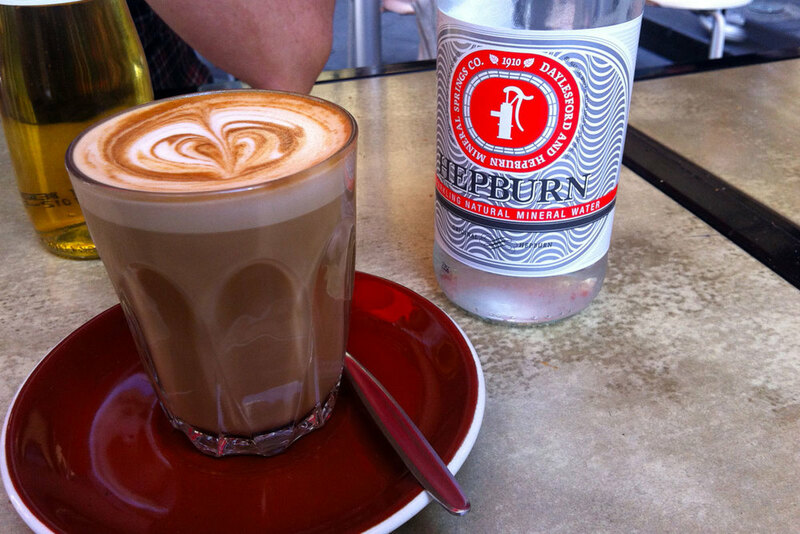 Whether you're visiting Anglesea or just passing through, you must stop by McGains to stock up on vegan goodies from the store or to enjoy what could be the only decent soy latte (w/ Bonsoy) for miles. The cafe is set in a light filled gazebo bursting with greenery, flowers and twisted tomato vines and is truly a relaxing place to sit and enjoy. While the cafe doesn't offer a huge vegan range, we were thoroughly satisfied with a delightful organic quinoa salad w/ fresh orange segments and pistachios, aside a cos salad w/ fresh dates, dried apricots and almonds ($15) - it really was something rather special. Another vegan option on offer for lunch was a falafel wrap ($12). We sampled a couple of refreshing Wort organic drinks as we'd never seen them before and the unusual flavour of 'peppermint and ginger' caught my eye. A vegan muesli slice ($4.50) made in-house and full of nuts and seeds also hit the spot. Great efforts have gone into stocking the best of everything at McGain's food store, including the freshest of fruit and vegetables. Tallyho Farm soy burgers, Earnest Bean Co organic smoked tofu and Primasoy three seeds tempeh (the one smothered in paprika and cumin) were available - which was impressive as these delicacies can be hard to find (in Melbourne, you can get these products at The Land of Soy & Honey). If sweets are your thing, you can pick up anything from the Loving Earth or Cocoa Rhapsody chocolate ranges or settle instead for a SuperOrb, date and walnut ball, organic dried mango, or my favourite - organic dark chocolate almonds! A trip to Frankston to meet a brand new baby boy was the perfect opportunity to also check out the 'much loved by locals' vegetarian cafe Aum Shanti. Aum Shanti Vegetarian Cafe & Art Gallery has such an earthy, homely feel that you'd be forgiven for thinking you were in the main street of Daylesford as opposed to seaside 'Franga'. 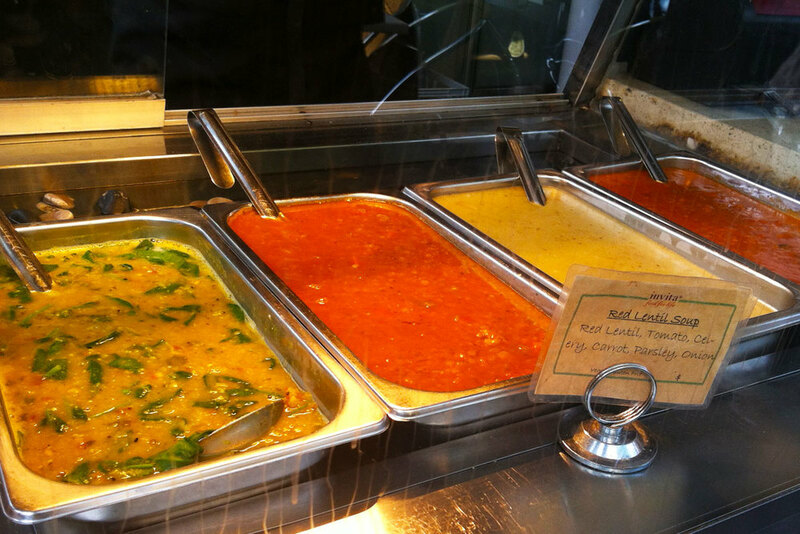 There is a lovely array of homemade meals and salads to choose from in the glass cabinet, or you can order funky pies ($5.50), wraps ($8), sandwiches ($8-8.50), soup of the day ($9 and always vegan) or a lentil and chickpea burger ($9) off the menu. Sourdough toast is the main vegan breakfast option so you'd be better off making your visit to Aum Shanti a lunch date. I had a 'Lentil & mushroom shepherds pie' with a scoop of quinoa salad ($12, GF) and it was a truly comforting homemade meal. The quinoa salad had a great crunch thanks to the addition of toasted seeds. A non vegan friend also partook in this dish and was as equally impressed. 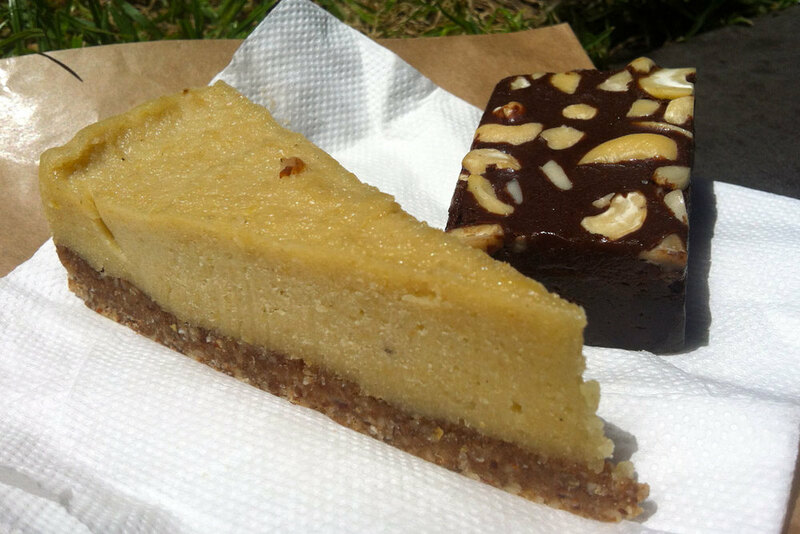 There are plenty of vegan sweets on offer including lemon melting moments ($2), Mr Nice Guy cupcakes ($4.50), an assortment of chocolates, and some raw desserts by Naked Treaties. 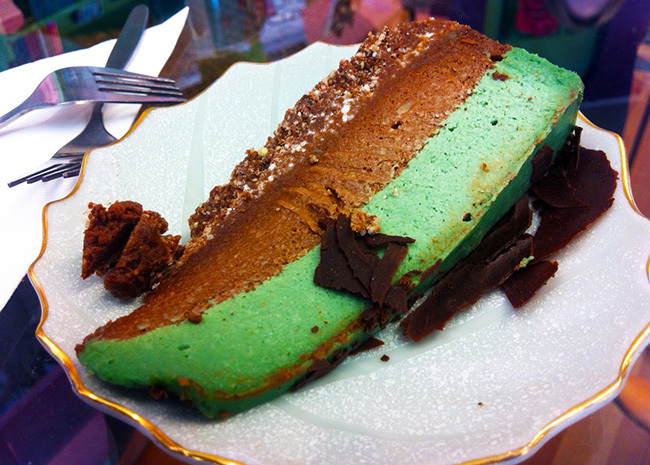 We gave the raw choc mint slice ($7) a whirl and it was reminiscent of the peppermint and chocolate layer cake at Shoku Iku - very rich so ideal to share. 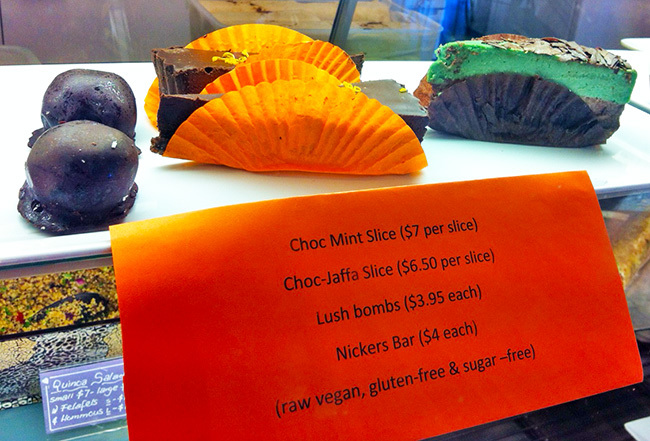 The Nickers Bar ($4) - a raw, vegan, sugar free 'snickers', was an ideal accompaniment to my soy latte ($4 - includes 50c soycharge). If soy milk isn't your thing, you can also have your coffee made with organic rice or almond milk, which will also attract an extra 50 cents - as does organic coffee. 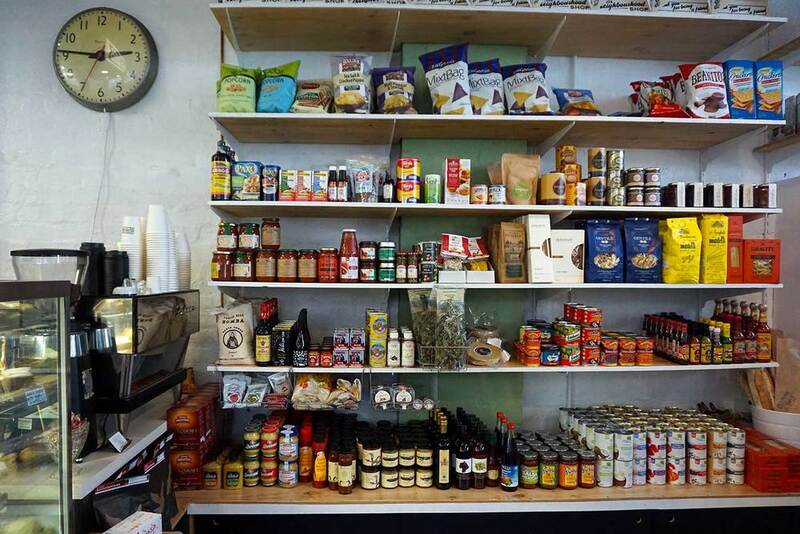 Along with being a great lunch place, Aum Shanti stocks a few vegan products which you would be hard pressed to find anywhere else on the peninsula. Notzarella, Castlemaine dips, Sweet Freedom 'vegan honey', Plamil organic chocolate spread, vegan jelly crystals and vegan condensed milk are among the loot. This cafe is a shining light in Frankston, and we're sure it will continue to be for many years to come. Invita Living Food is an all vegetarian cafe that has been feeding shoppers at the Queen Victoria Market for a good 10 years. To this day, Invita is still going strong by dishing up hearty vegan lunches and delicious vegan sweets. 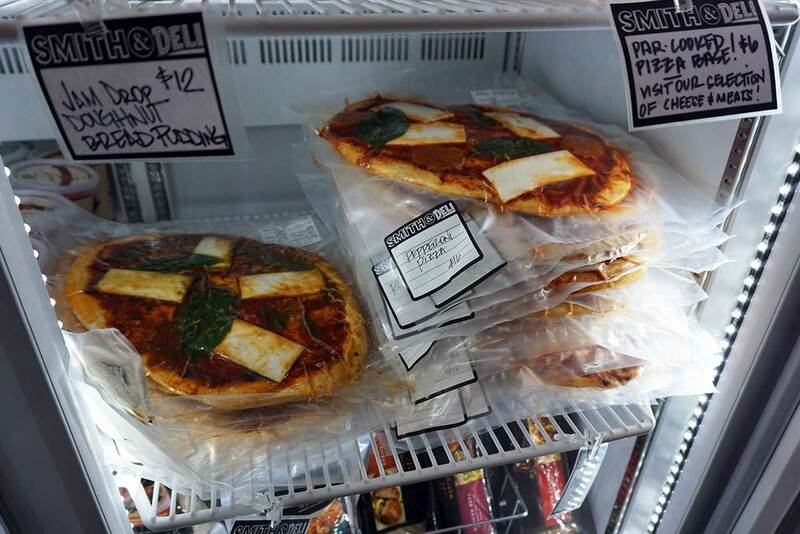 Invita has a great range of ready made vegan salads, soups (the potato and leek is tops), pies and wraps (not all are vegan, but all ingredients are well labelled) to eat in or takeaway. A recent visit saw me choose a quinoa salad, along with a roast pumpkin and walnut salad ($6.50 each), which made for a very tasty lunch. Also on offer, for those eating in, is a lentil shepherds pie, a tofu burger (tofu burger pattie - no bun) or rice balls - all of these options come with salad and are all gluten and wheat free to boot. Oh, and there's a scrambled tofu ($12.50) on the breakfast menu too. 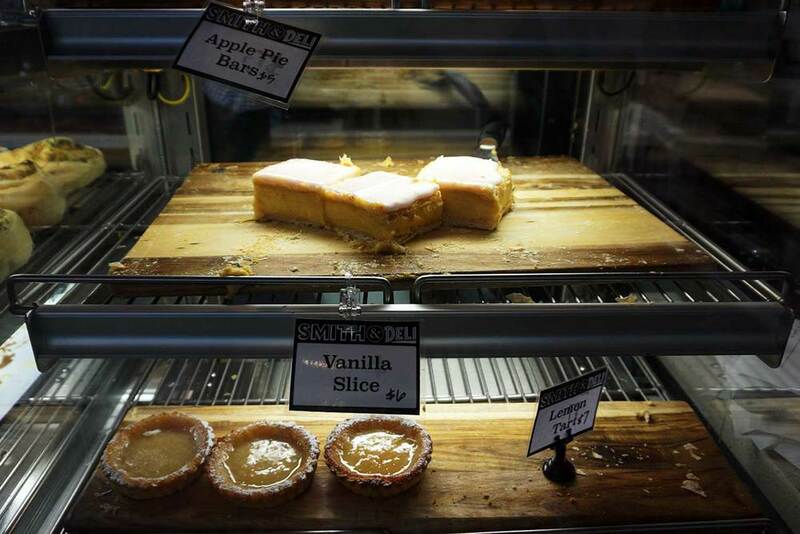 When it comes to sweets, there are also plenty of vegan options. The berry cheesecake ($6.50 takeaway, gluten free) is highly recommended, and must surely be one of the first ever vegan cheesecakes available in Melbourne (I've been eating it for years!!). Other delights include some seriously good berry muffins (which manage to have a crispy outside and a dense but fluffy middle - $4), lemon poppy seed cake and vanilla bliss balls ($3, gluten free). There was a really impressive looking vegan chocolate cake (gluten free) in the window last time which I'm yet to try. If you make it to Invita, be sure to pay a visit to The Land of Soy and Honey in the deli section of the Queen Vic Market for some grocery supplies. They stock some of the best tofu, tempeh and burger products around - all which can be difficult to find in supermarkets. I picked up a large organic smoked tofu ($7.30), some Tallyho Farm organic tempeh ($7.30 and proclaimed by me as the BEST tempeh), and some Blue Lotus tandoori marinated organic tofu ($4.90). They also usually have my favourite ever vegan burgers which are the Tallyho Farm Soy Burgers (around $7). After checking out the Rainbow Warrior which was docked at Port Melbourne on the weekend, we went off in search of breakfast in the unfamiliar territory of South Melbourne. 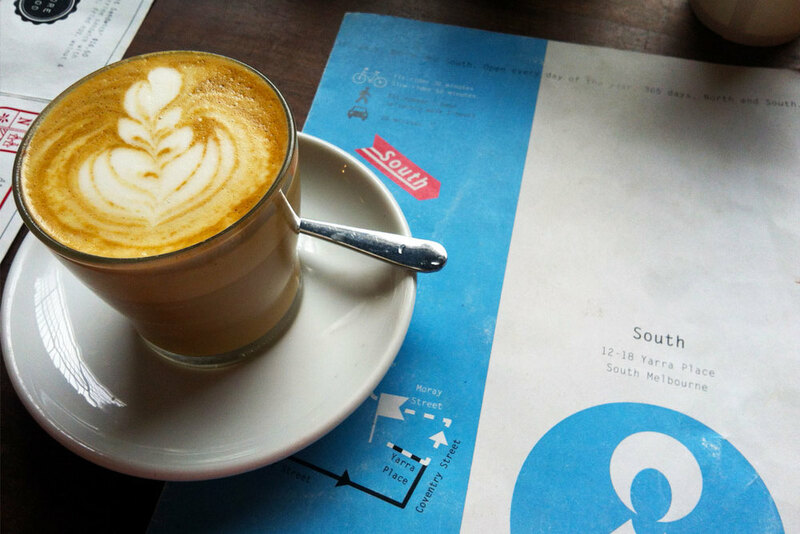 After scanning the menus of a few cafes near the South Melbourne market, we ended up off the main drag at the very busy, but large, St Ali - South (there is also a St Ali - North in Carlton). After scanning the menu, I noticed a vegan option right away that I had to try - the 'Wholefoods gluten free sandwich' ($16) which is a braised kale sandwich on gluten free bread with saffron chickpeas, sumac onion, vegan mayo and green salad. 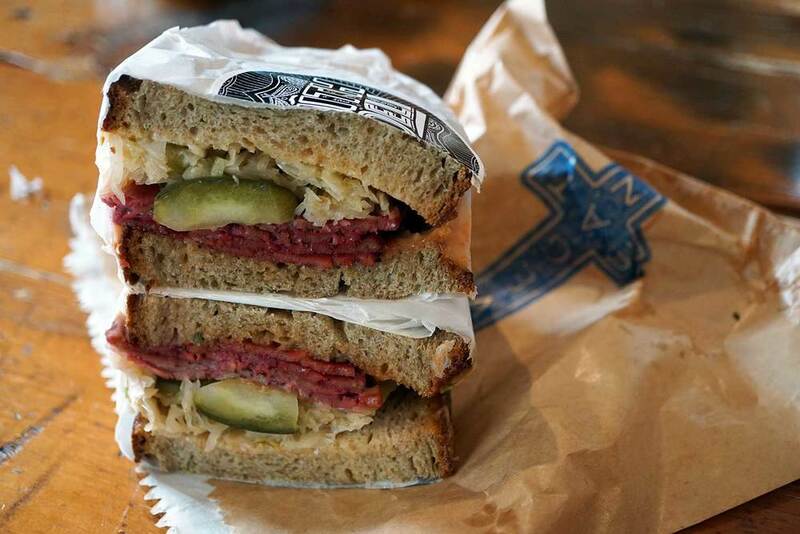 This sandwich deserves a much more exciting name as it's absolutely sensational! The kale is deliciously crispy and seasoned, the saffron chickpea is in a soft pattie that is amazing with the red cabbage and creamy vegan mayo and if you're accustomed to gluten free bread, then you'll especially appreciate how good this bread is! My sidekick was set on a more traditional breakfast, so he opted for a DIY option of some extras including field mushrooms ($4.50), roasted tomatoes ($4.50) and fresh avocado ($4.50) on sourdough ($2). Whilst this made for a simple breakfast, every element was cooked to perfection - he was especially impressed with the roasted tomatoes, which 'rival' the confit tomatoes at Wide Open Road. A point to note if ordering extras is that the bean ragout isn't vegetarian, let alone vegan (what's up with cafes ruining perfectly good beans with ham hock and the like?!). St Ali roast their own coffee beans which are also for sale, so needless to say their coffee was great - and good ol' Bonsoy is used at no extra charge which seals the deal nicely. 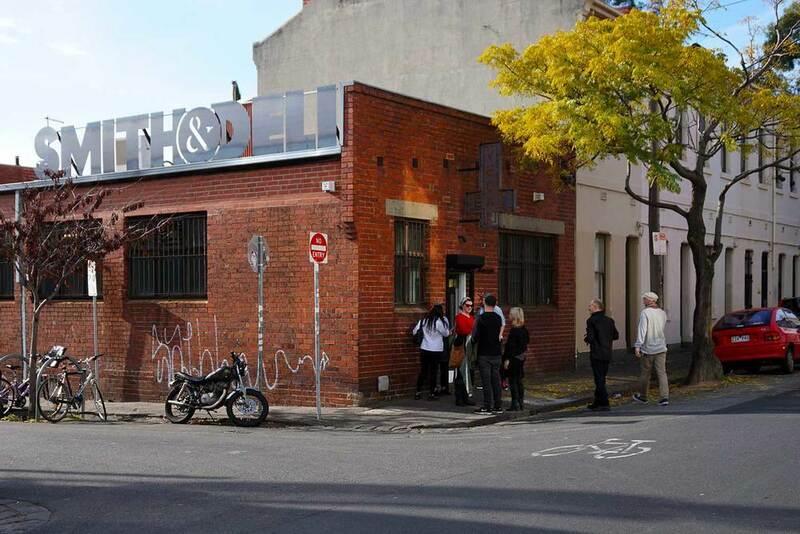 If you pay a visit to St Ali - South, be sure to also swing by the nearby Passion Foods to stock up on a variety of vegan groceries including vegan yoghurts (CO-YO! ), ice creams, cheeses (Vegusto! ), snack bars and more. There's also a good array of take home organic vegan salads that may take your fancy.